Like a number of beat groups of the 1960s, many of them started in local clubs playing covers of rock ‘n’ roll and blues numbers. London and Manchester were the two main cities producing quality musical acts at the time and then Liverpool dropped onto the map when the Beatles and the Searchers arrived. Scotland were a little way behind with Marmalade being one of the most successful, but before them, one group doing what the others were doing, and hyped for bigger things were the Poets, a five piece from Glasgow. A local Scottish publication, Beat News, did an extensive article on them and even put their picture on the front cover. The week it was published, Andrew Loog Oldham had headed to Gretna Green to marry his 18-year-old girlfriend, the reason for Gretna was because she was still underage according to English law, and whilst walking through Edinburgh airport he spotted the magazine and loved the way they looked. He got hold of Gallacher’s address and paid him a visit. Gallacher recalled, “It was a Sunday morning, I was still in bed and my mother came in and said, ‘George, were you expecting the manager of The Rolling Stones? '” He told him how impressed he was and organised an audition at the cities Flamingo Club. He was amazed by what he heard and was even more knocked out when he went to see them live later that night. He arranged for them to be taken off to London, secured a recording contract with Decca records and recorded a song that Gallacher, Paton and Myles had written called Now We’re Thru to be issued as their debut single. Before the song was released a promotional copy was given to John Lennon who apparently said it was, “F***ing weird.” Gallacher has a nasally sound which when heard over the heavy guitar and a mammoth production, gave the record a slightly fuzzy sound. They took to the road to promote themselves and were soon appearing on Ready Steady Go and Top of the Pops. Their debut appearance on the latter was not initially seen in parts of Scotland as there had been a power cut but it was repeated later in the week. 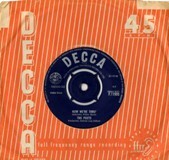 The single only reached number 31, “And wasn’t the major hit that we hoped for and indeed I don’t think that anyone believed it was a strong contender,” Tony admitted, “nevertheless it sold sufficient numbers to keep Decca interested and so everyone was happy. Despite the follow-ups, That’s The Way It’s Got to Be with a classy bass intro and I am So Blue they never troubled the chart again. When their contract with Decca expired Oldham signed them to his newly-formed Immediate label and released two singles, Call Again and Baby Don’t You Do It which sank without trace and are both valued at around £70-£80 these days. The latter was produced by Immediate’s in-house producer Paul Raven who later became better known as Gary Glitter. In the autumn of 1967, Gallacher, who was in London teaching Keith Richards about songwriting, had become disheartened and then found out that Oldham was withdrawing from band management which made matters worse and decided to leave the music business. He got married and took a job at Macdonald Pneumatic Tools Company in East Kilbride where he worked alongside Jack Bruce’s father. By 1971, a form of the Poets were still going and, by now, featured one time Marmalade members Hughie Nicholson and Dougie Henderson and recorded a promotional song, Heyla Hola, for a Barr soft drinks commercial. In 1980, Gallacher was made redundant but not letting it get him down he studied and completed an English and philosophy degree at the University of Strathclyde, and then five years of teacher training resulting in him qualifying at the age of 49. He worked in a couple of different schools but, according to the Scottish Herald in 2012, cherished his time at St Roch’s in Townhead, where he was at the centre of a unit dedicated to teaching asylum seekers, many of whom remained his firm friends. Four of the original members all died quite young; Dawson from cancer in 2002 aged 57, Weir from cancer in 2010 aged 67, Paton from a heart attack whilst on holiday in the West Indies in 2011 aged 65 and Gallacher of heart failure in 2012 aged 68. Tony Myles is the only member still alive and is currently working as the weekend breakfast DJ on Bayradio FM on the Costa Blanca in Spain.